Verifico — How do I send an Invoice? Support Home Knowledge Base Knowledge Base for Experts How do I send an Invoice? Every invoice must be associated with a specific client&apos;s application for the service. Open the Client tab on your dashboard and find the application, which should be under the active section. Open the application by clicking on it. Now choose whether it is an invoice for an escrow or immediate payment. Escrow should be used for a service that is still being worked on. Immediate payment should be chosen for a service that has been completed. Choose the type of service you are invoicing the client for; this should match the service application. Depending on the type of service additional fields may be required. Once you have completed the invoice you should write a note in the &apos;memo&apos; field with any additional information the client needs. Finally, fill in the invoice amount and the due date. The invoice amount should match the price in the service application. 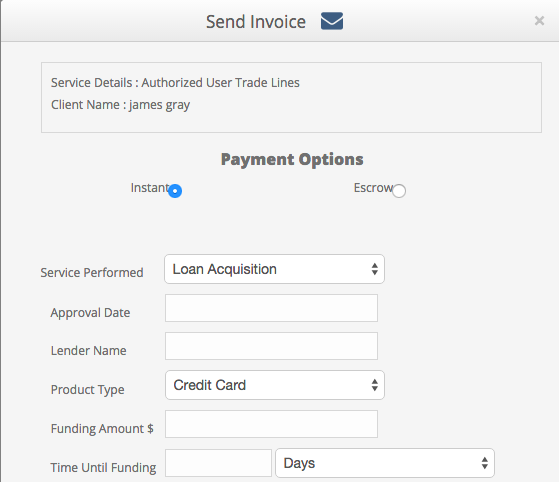 Click &apos;Send&apos; to send the invoice to your client. The client will receive an email that includes all of the invoice information you completed in the send invoice pop-up. It will include two links, one to send you a message if they have any questions about the invoice and the other to pay the invoice.